Hindsight study: Was Unger-Graham trade a good move? The two biggest concerns during the Seahawks’ 2-2 start have been the struggles of the remade offensive line and the inconsistent use of Pro Bowl tight end Jimmy Graham. For many critics, the two issues are very closely linked. 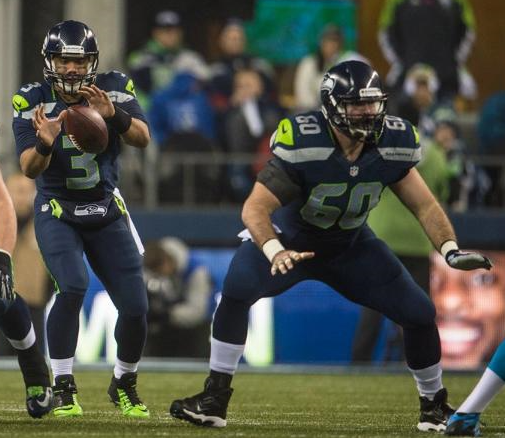 After all, the Seahawks gave up center Max Unger to get Graham. For the record, we were very in favor of that trade. But some were dubious, thinking it foolish to give up a top center for a tight end the Seahawks might not even use right. So, let’s revisit the question: Did the Hawks do the right thing in trading Unger for Graham? First, let’s look at how they have fared with their new teams through the first quarter of the season. Graham’s usage has been documented in great detail. He has been criticized for his blocking, which has certainly been poor at times. And offensive coordinator Darrell Bevell has been criticized for not getting Graham involved as much as he should — particularly in the loss at Green Bay. ESPN’s Sheil Kapadia broke down the difference in how Graham is being used compared to how the Saints used him. 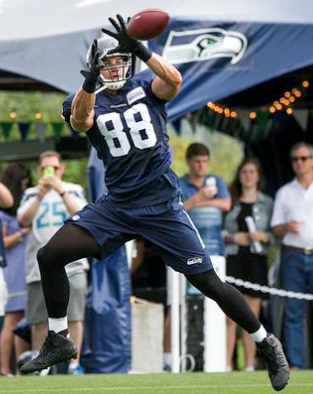 Bottom line: He’s a full-time tight end in Seattle. Danny Kelly of Field Gulls charted Graham’s plays vs. Detroit. In his first four games with Seattle, Graham has 18 catches for 174 yards and two touchdowns. That’s a pace for 72 catches, 696 yards and eight touchdowns. That’s about what you can expect in Seattle’s run-first offense, which actually has thrown the ball more this season than it typically does. Graham’s numbers always were expected to be less than they were in New Orleans, where he was Drew Brees’ top target and averaged 89 receptions, 1,099 yards and 11 TDs over the last four years. Regarding Graham’s blocking, Bevell said, “It’s been good sometimes; it hasn’t been good sometimes. He’s willing to do it; he’s willing to continue to work on it. He’s a tight end for us. That’s something that’s part of the position. Graham isn’t the only inconsistent part of Seattle’s blocking. The offensive line, which features new starters at three positions, had a very inconsistent first quarter of the season. The front five seemed to take a step back in an ugly 13-10 win over Detroit last Monday. Quarterback Russell Wilson was running for his life for most of the game and ended up losing two fumbles for just the second time in his career. The Seahawks have given up 18 sacks — a pace for the second most in NFL history — and have not scored a rushing touchdown yet. Drew Nowak, the surprising replacement for Unger at center, has had problems getting the shotgun snap to Wilson consistently. Nowak has given up one sack and committed two penalties. Justin Britt, who moved from right tackle to left guard, has given up 1.5 sacks and committed three penalties. Right tackle Garry Gilliam has given up two sacks. Right guard J.R. Sweezy has surrendered three sacks and committed two fouls. Left tackle Russell Okung has given up two sacks and committed two penalties. Graham has given up a couple of sacks as well, and the rest of the sacks have come from receivers not getting open or Wilson not throwing the ball quickly enough. Much of the problem is communication and inexperience. Unger was a rock in the middle, and the Seahawks were obviously better when he was there. But the fact is he had missed 13 games over the past two years, and the Seahawks felt like he was no longer worth his $5.5 million salary. They were planning to let him go, but the Saints — desperate to upgrade their line — asked about him, and that led to Graham being included and each team throwing in a draft pick (Seattle sent a first for a fourth). Unger has so far been healthy for the Saints, starting all four games and giving up one sack while committing one penalty. The Saints, a pass-first team, are toward the bottom of the NFL in rushing (82.8 yards per game). So, it appears the trade hasn’t really helped either team yet. But the Seahawks are just getting started and they fully expect their offensive line to improve and Graham to contribute. Some might be shaking their heads at the trade now; but, by the second half of the season, the Seahawks’ offensive line and Graham should be settled in — and the deal will look as good then as it did when it was made.